"In the UK there is a form of motor sport called "Stock Car Racing," but this is not the same as you have in the USA [NASCAR}, but closer to what you race as sprint cars, running around short shale ovals. British Stock Car Racing is a contact sport and has a big following over here. The BRISCA stock cars are single-seat, front engine beasts of about 5 litre capacity, usually American V-8 engines. The drivers are graded by color, white top being novice, gold being reigning champion. Just to make things interesting, the fast guys start at the back and have to pass the slower drivers. The result is total carnage! Slot Stox is a 1/32 scale version of this mayhem, originally dreamed up by some of the full scale enthusiasts, for something to do out of season. The tracks are usually short 6 or 8 lane ovals with 1 end and 1 part of a straight chicaned [pinched]. 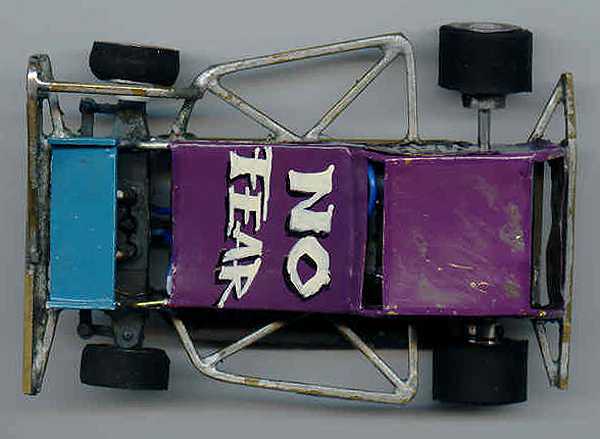 Here are pictures of Chris Crewe's 1/32 scale Slot Stox." "Chris races at Rossendale Model Stock Car Club. They have a website: RMSCC. 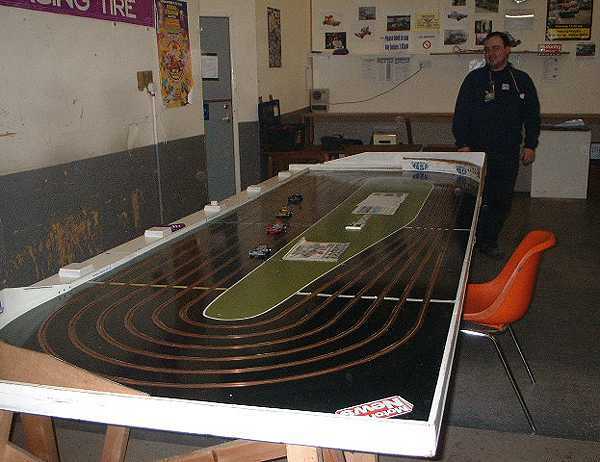 The Slot Stox are currently residing in the back room at Pendle club, where they have a six lane short oval. 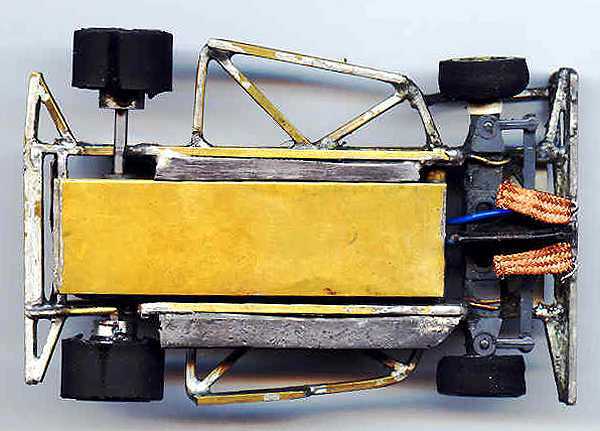 The cars are built from Scalextric bits and brass tube and plate. The object of their racing seems to be to bash the daylights out of each other with these heavyweight rockets. Takes all sorts, but they love it and the club is thriving!" "The cars are heavy and are purpose built for heavy impacts"
"Here's a picture of the Rossendale Slot Stox track, with Chris Crewe in the background."